I hope everyone had a wonderful Thanksgiving! I had a delicious meal cooked by my lovely seestra and the most epic leftover sandwich ever on Friday. We played multiple rounds of Oregon Trail and Batman Love Letter and drank a shocking amount of adult beverages. The whole weekend was fun and cozy and I may finally be able to think about eating poultry again. I hope you are too, so get a spoon ready. Yes, I said spoon, not fork. Because bacon, chicken juices, onion and mustards (plural) have all come together into the most divine sauce. You can bathe your chicken in it, and maybe pour over some mashed potatoes, and you should, but you also might find that you want to just dip a spoon into the sauce and treat yourself to a few mouthfuls. You should totally do that too, so grab a spoon. As for the chicken, this is a great, simple, easy recipe for a weeknight dinner. You can have the legs roasted, sauced and served in about 45 minutes, but it tastes like you spent hours. That's a fun Tuesday night chicken dinner, if you ask me. This recipe is fully based on David Lebovitz's mustard chicken from My Paris Kitchen, and I changed basically nothing. Because he might be known more as a pastry chef, but this recipe proves why he's also an excellent chef of savory food as well. The first time my sister served this chicken to me, I basically died. It was so good. I knew I had to spread the word, because chicken in a sauce this good is a crime to keep to yourself. Adapted from My Paris Kitchen. I halved the recipe to better suit my being one person, but the recipe is easily doubled back to the original 8 pieces. Feel free to mix thighs and drumsticks here, I used thighs because I prefer them. Mix 1/4 cup of the dijon with the paprika, a few grinds of pepper, and salt in a large bowl. Add the chicken thighs and toss in the mixture, rubbing all over the thighs and under the skin. Heat a large, heavy bottomed skillet or dutch oven (something with a cover) over medium-high heat and add the bacon. Cook, stirring, until cooked through and browned, about five minutes. Remove bacon and drain on paper towels. Leave all the bacon drippings in the pan or pour out all but 1/2 tbs if you like. Add the onion to the pan and cook 5 minutes until soft. Stir in the thyme and continue cooking a few minutes more, then transfer onions to a bowl. Add a little olive oil to the pan if needed and place the chicken skin-side down in the pan in one layer, being careful not to crowd the pan. Cook the chicken over medium-high heat, turning to brown well on both sides. Remove the chicken and add to the bowl with the onions. Add the wine to the pan and deglaze it, scraping the bottom with a wooden spoon to get up all the yummy bits. 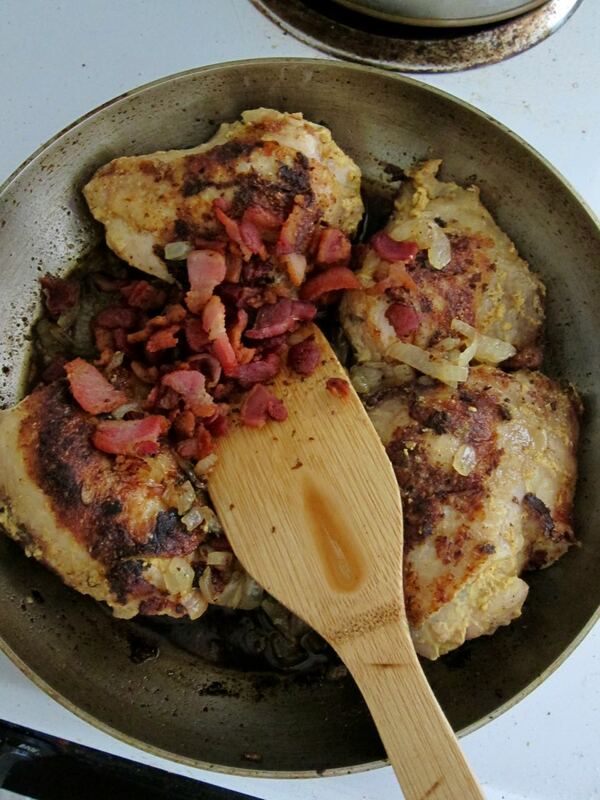 Return the chicken and onions to the pan, add the bacon, and cover and cook over low-medium heat for 15-20 minutes until cooked through, turning the chicken a few times. Remove the pan from the heat and stir in the heavy cream, remaining dijon and grainy mustard. If the sauce seems too thick you can thin with the water. Garnish with the parsley and serve hot.